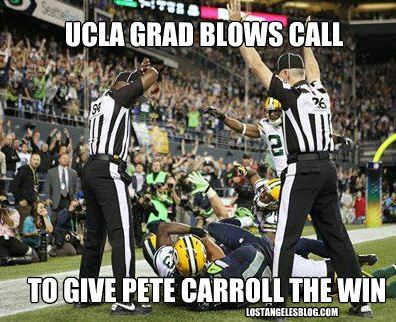 Lance Easley is the NFL replacement ref who made the infamous TD call in Monday night’s Packers vs. Seahawks. He is also a Bruin. Funny, I have access to the UCLA alumni database, and this gentleman does not appear. So unless he’s ref-ing under an assumed name or you can produce further evidence, we’ll have to rule this art a FAIL!